A miniaturization study is very important in order to know what the level of hair miniaturization is for the patient. Using this method, the Doctor can also know what rate the hair is thinning. 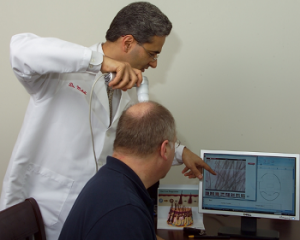 The hair restoration surgeon can compare the hair loss area to the individual’s normal healthy hair. The hormone that causes hair to thin is known as the DHT hormone. The hairs that are not affected by the DHT hormone are in the donor area, which includes the hairs on the sides and back of the head. Hair goes through a cycling phase, where a hair shaft falls and after a few weeks another one begins to grow from the same follicle. In most cases the cycle won’t pass 20% of the hair shafts in any area. Hair loss will become active because the follicles of the hair go through a growth cycle. During the growth cycle process, there are resting intervals where the hairs slowly start to get thinner and miniaturization occurs. Only a small percentage of the hairs will be in resting phase. Miniaturization occurs when the hair shaft is no longer as thick as it was before. At that time the hairs become very thin and it is not seen to the naked eye. When the hair restoration surgeon is doing the microscopic evaluation, he or she will determine the percentage of miniaturized hairs by area. When they look under the microscope at areas of the head, they estimate the percentage of miniaturization. If there is any part of the head that is over 20% miniaturization, that would be considered abnormal. That area would need to be evaluated and treated because that shows the surgeon that the patient will eventually lose the hair in that area. At that time the hair restoration surgeon will explain the different options that you have to prevent hair loss. If your hair loss has been active for a while, the Doctor can also recommended that you have a hair restoration procedure.